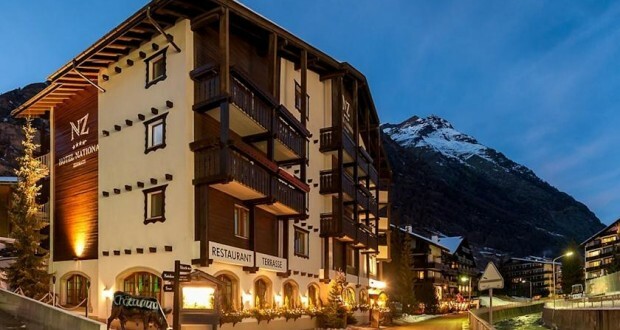 In the center of Zermatt right across from the Sunnegga-Paradise Ski Lift and only a 5-minute walk from the train station, the Hotel National is the only hotel in Zermatt with exclusively south-facing rooms and a balcony in every room. Most rooms also offer views of the Matterhorn Mountain. Every room has a flat-screen TV, tea and coffee-making facilities and a modern bathroom. Fresh fruits and a welcome drink await you upon arrival. You can spend pleasant hours at Hotel National Zermatt’s bar with its fireplace. Free use of an iMac in the lobby is available. A DVD player and smartphone docking stations are provided upon request and you can also borrow DVDs and books on site. The hotel features a 3,875 ft² spa oasis with pool, caldarium, aroma grotto, sauna, dream shower, Kneipp grotto and tepidarium with Mimaroso warm beds. A wide range of different activities including Yoga, Pilates and Aqua Fitness is available on site. You can work out in the hotel’s gym and request a personal trainer at the property. Sun beds are available as well. A garden with a terrace and an ice bar in winter is a further feature of Hotel National Zermatt. Evenings with live music are organized on a regular basis. In summer, barbecue specialties from the region are available every Saturday.